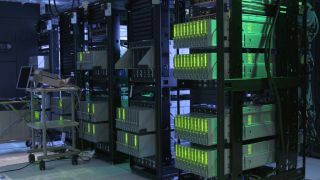 Huge new prototype from HPE boasts 160TB of system memory - enough to potentially power a trip to space. HPE has unveiled a hugely powerful new platform which it believes can help usher in a potential new age of computing. The latest offering from its "The Machine" research project, the new prototype comes with a whopping 160TB of memory, spread across 40 physical nodes - the equivalent of 6,000 Blu-Ray discs. However HPE has grand aims for its new release, as it claims the platform would be ideal for overseeing a future mission to Mars. "The Machine" would be able to predict future events and actions that current sytems are unable to process, linking together various CPUs, GPUs and other processors through laser-light connections, which is much faster than current platforms. "The secrets to the next great scientific breakthrough, industry-changing innovation, or life-altering technology hide in plain sight behind the mountains of data we create every day,” said Meg Whitman, CEO of Hewlett Packard Enterprise. Today's release is HPE's next step towards a new computing idea called Memory-Driven Computing, which it says could be vital in propelling forward the next major scientific advances. The company ultimately sees this program unlocking possible exabyte-scale single-memory systems and even further - possibly even to nearly-limitless pools of memory. This could power a platform that is simultaneously able to work with every digital health record of every person on earth, every piece of data from Facebook, or every trip of Google’s autonomous vehicles. “We believe Memory-Driven Computing is the solution to move the technology industry forward in a way that can enable advancements across all aspects of society,” said Mark Potter, CTO at HPE and Director, Hewlett Packard Labs.